Certain native peptides render consistently low immunological responses, despite the fact that they are conjugated to a large carrier protein (e.g. KLH, BSA). When carrier proteins are not sufficient or cannot be used for immunizations, multiple antigenic peptides (MAPs) are a popular alternative. MAPs are peptides that are branched artificially. The presentation of peptides in branched forms can sometimes enormously increase their immunological responses. This approach utilizes the α- and ε-amino groups of lysine to form a central backbone to which multiple peptide chains can be attached. 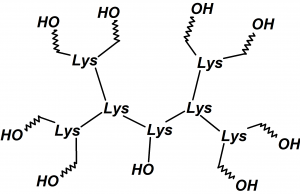 The lysine based core supports the formation of up to 8 branches, containing varying or the same peptide sequences. Because of the multiplicity of the peptides, MAPs are able to induce immune responses. MAPs have a high molar ratio of the peptide antigen to the core molecule, and the high molecular weight (compared with that of the peptide) make them suitable for immunization without the need for conjugation to a carrier protein. 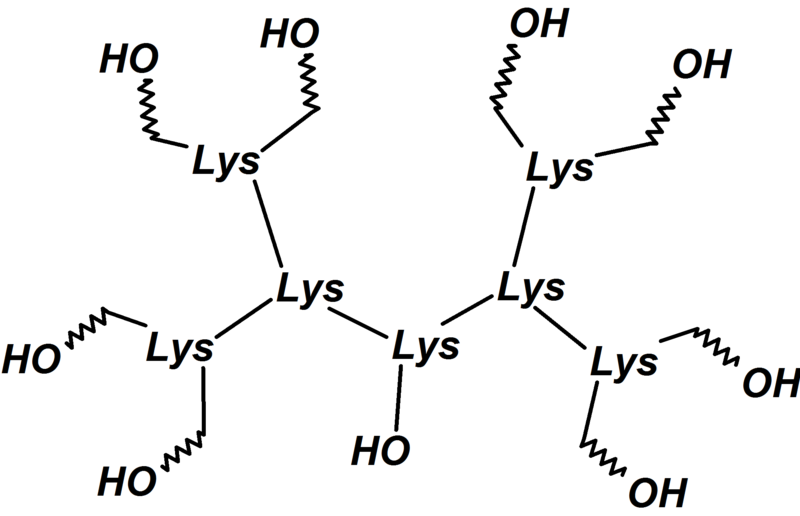 The synthesis of MAP can be problematic, as the strict spacing between each of the eight branches might lead to aggregation of the peptides on the resin. This could result in low coupling yields and peptide deletions. Pepscan has developed a synthesis strategy for MAPs to overcome these issues, and has over the years supplied MAPs to a multitude of customers.